So today 12th May is Fibromyalgia awareness day. I suppose I should be writing how people understanding this illness would be a step forward, but to be honest I don't think it would. People are hateful and cruel most of the time to anyone who isn't what they expect them to be. So whether or not they had all the facts about Fibro they would still be assholes. Being disabled, fat, black, gay whatever it is will always be the trigger for abuse no matter how much awareness there is in the world. 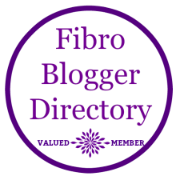 I would rather have a Fibromyalgia Cure day, now that would be worth advertising! !